Bring out the best in your photo with a striking Pop Art Acrylic Frame made of a glossy material with a luminous neon look. The vividly colored versions of the Pop Art Frame are a bold accent. For a subtler effect, choose the glossy white or black versions of the Pop Art Frame. With a fluorescent effect in neon red, orange, green, or blue, the four different transparent Pop Art Frames add to your picture’s impact. With this ever-trendy frame, you can mirror colors from your photo or create a stunning contrast. The front edge is just 1/8” (3 mm) wide and the way light reflects off the frame creates a striking effect. The black and white Pop Art Acrylic Frames are perfect for prints of very expressive images. The subdued colors and opaque material mean these options create a very refined accent in the overall presentation of your image. The shiny, smooth acrylic glass reflects light that falls on it, bringing out the best in your pictures. 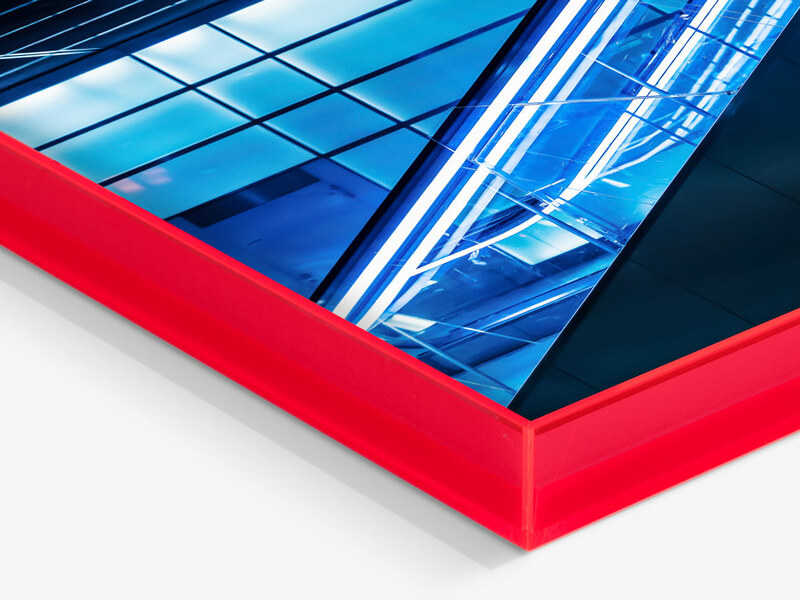 In order to achieve the vivid luminosity, we use top-quality, glossy acrylic glass for our Pop Art Acrylic Frames. For an additional feeling of modern lightness, we use a ¼” (7 mm) gap to make your picture look like it is floating inside the frame. Take advantage of various substrates to find the perfect look for your Print With Pop Art Acrylic Frame. Glossy surfaces enhance the radiant effect even more, whereas matte surfaces make an exciting contrast. 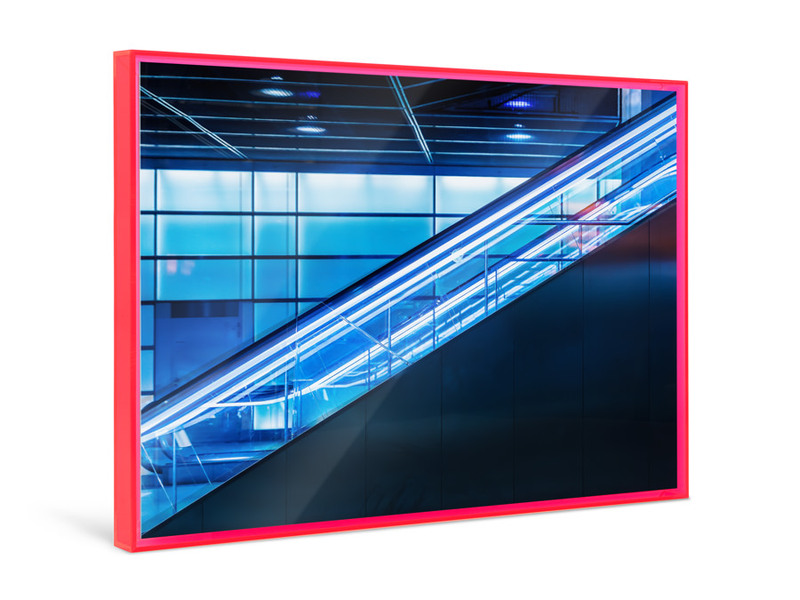 For crystal-clear details, you can also select our ultraHD Photo Print mounted on aluminum Dibond or under acrylic glass. We have a variety of printing and mounting materials available for you. Select your Pop Art Acrylic Frame from seven different sizes ranging from 8” x 8” (20 x 20 cm) up to 24” x 16” (60 x 40 cm). Find the perfect measurements for your image or to fill any space on your wall. We deliver your Pop Art Acrylic Frame with an integrated wall-mount on the back. This way, you only need two screws or hooks to hang your picture on the wall. Fast with no fuss. Not only are the trendy Pop Art Acrylic Frames a lot of fun, they are truly attention grabbing when hung on your wall. 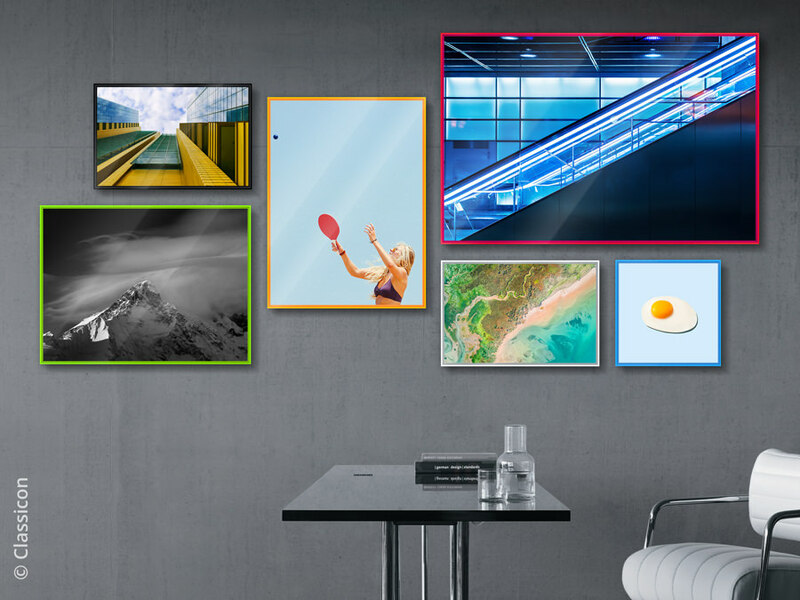 The way you display colorful pictures doesn’t have to stop at the edge of the picture frame! With the neon effect of the colorful versions, light falling on the frame makes your piece fluoresce into the room. The black and white versions are also a glossy finishing touch for your photos. With the gap between picture and frame, even the larger formats appear to be floating, for a truly light feel. There are a lot of opportunities to put colorful images in the spotlight with Pop Art Acrylic Frames. For example, any of the four neon colors creates an extraordinary effect in combination with your nighttime photographs of neon signs. By mirroring a color from the image with the frame itself, the picture and frame become a fascinating, unified piece. You can design a similar effect with black. Ideal candidates include architectural photographs with dark, reflective surfaces in the image that are mirrored by glossy black acrylic frame. On the other hand, you can also create an arresting contrast by combining a black-and-white photograph with a vivid Pop Art Acrylic Frame. Images with very intense color, such as fireworks photography, are elevated to nearly room-filling luminosity through a Pop Art Acrylic Frame. 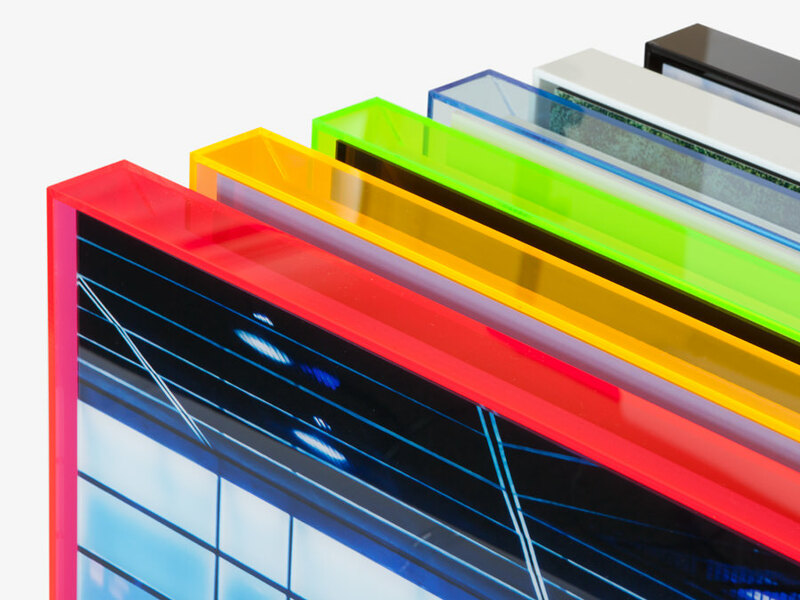 Combine Prints With Pop Art Acrylic Frames of different sizes and colors to create a unique gallery wall that fluoresces differently depending on how the light hits it. Our frames are not merely decorative; they give your photo more expressive power. While the neon colors and glossy surface of the Pop Art Acrylic Frames are powerful creative tools, our Aluminum ArtBox and Solid Wood ArtBox are more reserved with a timeless design. This is another frame option with a gap for a floating effect, and they also come with many different options. The ArtBox in silver or black aluminum feels very cool, clear, and stylish, whereas the woode version emanates natural warmth. Additionally, you can also select the depth of the frame and choose the photo printing and mounting options that are best for you. If you are especially drawn to the “floating” picture look, it pays to take a look at our Floater Frames.